Are you interested in discovering some exciting children’s activities with a patriotic theme? You’ve reached the right place! 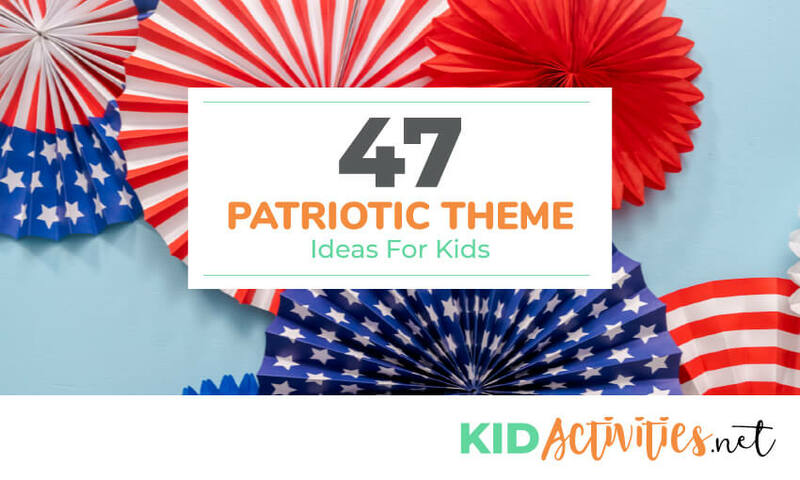 This guide shares dozens of patriotic theme activities including patriotic songs, patriotic crafts, and many other patriotic projects for kids. Children love patriotic activities! They enjoy creating arts and crafts that celebrate where they come from. 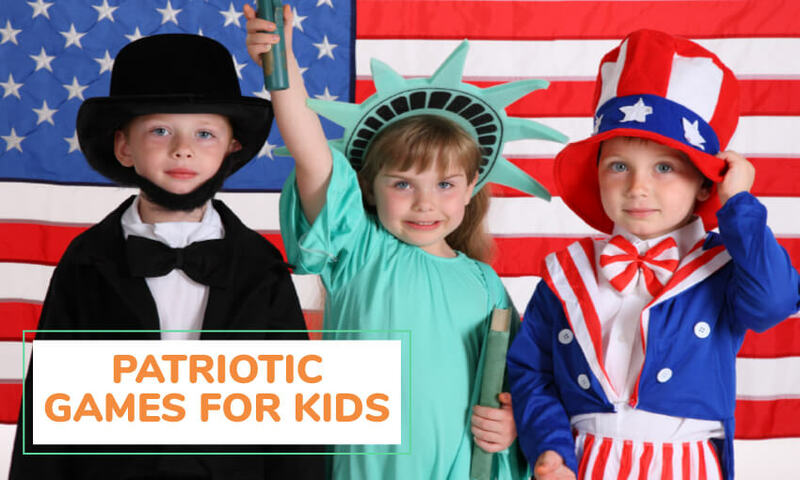 Kids also enjoy learning the songs and stories of the patriots who came before them, like Thomas Jefferson, John Adams, and Benjamin Franklin. Patriotic theme activities are perfect for events like Flag Day, Memorial Day, 4th of July, Labor Day, Last Week of School, or any event involving USA sporting teams. 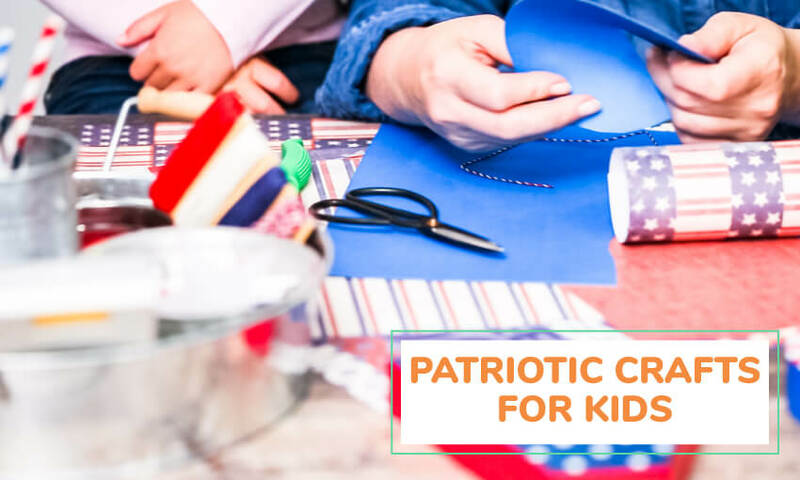 Many of these activities work well as flag day activities for kindergarten children and as patriotic crafts for preschoolers. There are also many patriotic recipes and patriotic foods for kids on page 2. 1. Cut out craft foam stars and use a shapened pencil to poke a hole in the middle of each one. 2. String them onto a length of elastic cording, alternating the stars with sections of straw or drink stirrer. Knot and wear. Felt paper in red, white, and blue, white star stickers, dowel stick, glue, and scissors. Give each child a large rectangle piece of white felt. Students (or the teacher) will cut out a blue square and 7 red strips. Glue onto white felt rectangle to resemble flag. Once dry, have students place white star stickers onto blue felt square. Glue the edge of the flag to the dowel stick and let dry (it may be best to use a glue gun). Let dry. Kids will have fun at parades and other celebrations with these hand held ribbon streamers. With just a few strands of ribbon you can create an accessory that looks cool when kids run or dance with it. 1. Wrap the striped red, white, and blue ribbon around the paper towel tube, applying tacky glue under the ribbon as you work. You can wrap the ribbon at an angle or horizontally, whatever you prefer. 3. Cut three strips of red ribbon that are 46 inches long. Cut three strips of blue ribbon that are 46 inches long. Cut three strips of white ribbon that are 46 inches long. 4. Tie a knot in the top of each strip of ribbon. If you can’t find striped red, white, and blue ribbon, you can wrap around individual strips of red, white, and blue ribbon. This project is a FUN way to decorate for any patriotic holiday, or to show your USA pride all year-round! American Flag Windsocks are easy to make and perfect for Memorial Day and Fourth of July. Remove cover and cut bottom off oatmeal box. Cover box with blue construction paper. Decorate box with stickers and glitter. Cut red and white crepe paper streamers, glue to bottom end of box. Punch four holes along the top end of the box. Cut two pieces of string about a foot long. Tie strings to the holes you have just punched, tie opposite ends of strings to holes on opposite side. Cut an additional longer piece of string. To hang windsock—tie this to the other two strings. Hang windsock from porch, window or a tree! TIP: ‘USA UNCLE SAM WINDSOCK’…All Windsocks can be decorated to any theme. For this windsock, it is suggested to start painting/decorating from the top and work your way down. 1. Cover toilet tissue tubes with red or blue construction paper and have children decorate them with silver star stickers. 2. Cut red, white and blue crepe-paper streams –into long and narrow strips. Have children glue the strips to one end of their tubes to make pompoms for shaking. 7) PATRIOTIC PROJECTS FOR KIDS – WHITE AND BLUE TWIRLERS! Hang from a window frame, tree, ceiling or porch! Cut stars out of red, white and blue construction paper. Make a head band out of white construction paper (make it long enough to fit around the child’s head). Glue stars on the band. Red, white and blue stickers can also be added. Place band around child’s head to get the size right. Staple the band to make a circle. 1. Start by cutting out the center of a paper plate – discard the center. 2. Cut tissue into 6″x6″ squares. Scrunch a piece of tissue up and dab it into the glue and place on the plate. 3. Continue doing this and alternating colors until the plate rim is filled all the way up. 4. Add a little sparkle by adding some silver streamers or ribbon here and there. 5. Staple a pipe cleaner to the back of the wreath to make a hanger. 1. Cut out the center of two red plastic plates. 2. Fill the large plastic bag with colored sequins. (The Frisbee works better if you don’t put in too many sequins. 3. Place the plastic bag filled with sequins in between the two plates. 4. Staple the two plates together around the edges with the plastic bag in between. (It helps to have one person hold the plastic bag on each end so it’s taut, while the other person staples the plates together.) 5. Trim the parts of the plastic bag that hang outside the edge of the plates. 6. Go outside and throw the new Frisbee! 1) Paint red stripes on star fish leaving the upper left quadrant blank. 2) Paint blue in the upper left quadrant. 4) Paint small white stars in the blue painted section. 12) FUN PATRIOTIC ART FOR KIDS – RED, WHITE AND BLUE PONY BEADS! Don’t forget to put out the red, white and blue pony beads to have the children create necklaces and bracelets. Put out red, white, and blue embroidery floss for ‘FRIENDSHIP BRACELETS‘! 13) MAKE A STRING OF PATRIOTIC STARS! Make a decorative string of stars to celebrate any red-white and blue day! 1. Make large star cardboard templates for the kids to trace. 2. After stars are traced—Cut them out and decorate it if you like. 3. Fold over one tip of the star and staple, tape, or glue the star to a length of string. 4. Make many stars and attach them to the string. 5. Leave some extra string at the edges for hanging. Now you can decorate any area with a patriotic flair! 1. Have children fill the film canister halfway with corn kernels and decorate with stickers. 2. Staff members can then poke a hole in the lid of each canister and children can thread some curly ribbon through the hole. 3. Knot the ribbon on the underside of the lid and let the rest stream out of the top. 1. To make the streamers, have children glue (or have a staff member staple) lengths of crepe paper to the inside of a cardboard tube. To make party crackers, take an old paper towel roll and cut it in half or thirds. Place small favors such as erasers, tiny toys, stickers, or small wrapped candy inside. Roll the filled paper towel roll in party wrapping paper allowing extra paper at both ends. Twist the excess wrapping paper at each end and tie with ribbon or yarn. Party crackers!!! 1. Cut out a basic Uncle Sam-style hat (about 2 inches tall and 1 inch wide) from white craft foam. 2. Use markers to color the brim blue and to draw red stripes on the top. 3. Glue the hat TO THE HANDLE of a wooden craft spoon iIf necessary, first use scissors to trim the wooden handle so that it’s shorter than the hat). 4. Glue on googly eyes and a cotton ball beard, then draw on a small L-shaped nose. 5. Attach a self-adhesive pinback (sold at many craft and bead stores), and your Uncle Sam pin is ready to wear. 1. Paint the rim of the flowerpot white and the lower part of the pot blue (or paint the rim blue and the lower part white). 2. Let the paint dry. A second coat may be needed, especially for the white paint. 3. No matter which style you choose…Paint white stars on the blue portion; paint red stripes on the white part. Whether it’s a Parade, Presidents’ Day, a 4th of July celebration or any other fun event you attend, this patriotic wand is perfect for showing your pride. 1. Roll blue construction paper into a tight cone and tape closed. 2. Cut each crepe paper strip into 3 parts of equal length. Next, cut strips in half lengthwise, creating two thin strips from each regular strip. You should end up with six strips of each color. 3. Place a small piece of tape at the end of one of the red strips. Press the tape inside the top of the cone. Repeat this step using a white strip. Repeat for remaining strips, alternating between red and white, work your way around the top of the cone so that your streamers are equally distributed. 4. Decorate strips and cone with star stickers. To make a sturdier parade stick, try using card stock or poster board for the handle. Get stickers from the dollar store or check the clearance racks at the craft supply or discount department store. With plastic pony beads, ribbons, chenille stems, lanyard and tissue paper, kids can decorate the center and themselves. Lace red white and blue bead strands to clip on patio umbrellas. Use a chenille stem to bead stars to add to the ends. Make red, white and blue TISSUE FLOWERS. Put in vases/jars or tie them on curling ribbon to decorate the corners of a picnic table. See ’tissue making flower ideas’ in the “Flowers Theme” of this site. Gather several packages of red, white, and blue beads and white pipe cleaners. Make a few example patterns with the beads on the pipe cleaners. Set the remaining beads and pipe cleaners on a table and allow the children to copy any of the patterns on their own pipe cleaners. 1. Work on old newspapers. 2. Spread glue on the paper in geometric shapes. If the glue is soft enough, you can put a small blob of glue on the paper, and then blow some air through a straw to spread it into interesting shapes. You can experiment with the consistency of the glue and the angle of the straw. 3. Sprinkle glitter onto the glue. Slide the excess glitter off your picture and back into the glitter container. For each color: In a paper cup–dilute some acrylic paint with water to a runny consistency. Using a paintbrush, drip a few drops of paint onto a piece of paper or card stock (be sure to rinse the brush between colors). Hold a drinking straw directly over each puddle of paint and blow gently to create a spectacular starburst effect. 3. Fill the mustard bottles with the mixture (one color per squeeze bottle). 5. When they’re dry, the design will be raised and will sparkle! Dip the end of a Q-tip in glue and glitter and have children glue them on a black piece of paper in the shape of a star – they look like fireworks! Pull out the red, white and blue paint. PAINT STARS OR A FLAG on the cheeks/face of the kids! Here are a few ideas. 1. Gather red, and blue paint—take it outside and paint the grass blade tops! 2. Set ‘white’ paper on the painted grass. These are lawn prints, but will resemble fireworks on the paper. TIP: You can also use different colors for a non-thematic “quick” activity. This is adapted from an idea by caregiver of autistic children. This actvity is especially good with young children! 1. Put out pre-cut-shapes of the flag —blue rectangles, red stripes, and sticky stars. 2. 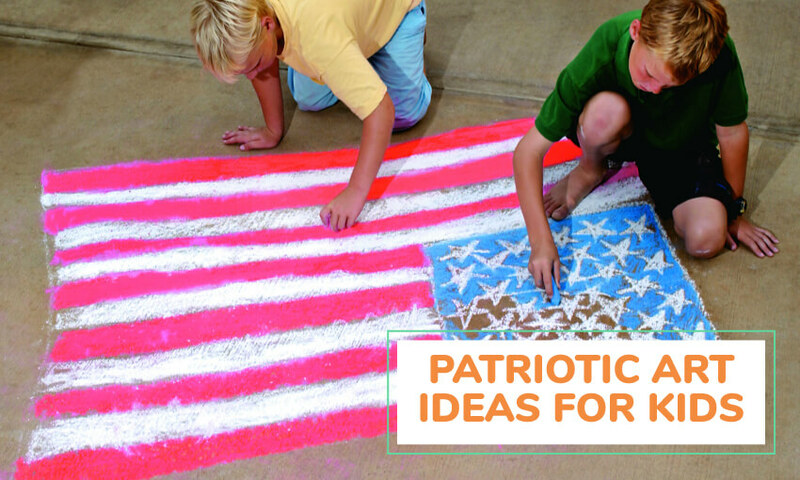 Instruct the children to create anything they’d like… Some may look like the American flag and some may look like abstract collages—but all will be patriotic! Bring out the artistic side of your celebrants by setting out colored chalk and inviting them to draw a RED, WHITE & BLUE HOLIDAY SIDEWALK MURAL. They might try their hand at colorful fireworks, or as a team–create a giant American flag. The bigger kids can sketch the outline and work on the stars, while the younger ones can help with the stripes. If you have a sunny, dry month—your sidewalk show of patriotism could keep the spirit alive for weeks. 1. Pour paint into shallow containers. 2. Have the children dip the Queen Anne’s Lace blossoms into paint and lightly dab them on their papers. Have a flag as a guide for the kids to follow. Tearing strips of red, white and blue paper, have children glue them onto a large sheet of construction paper. Make sure they know what size they should be trying to tear for the stars, stripes, etc. This is a good idea for younger children but the older may also enjoy it. 1. On the large sheet of paper, draw lines for stripes and paint a blue square in the upper left corner. 2. Have the children fill in the bottom stripe by dipping their hands in the red paint and pressing them end to end within the lines of the stripe. Using the white paint, have them make a white stripe just above it the same way. 3. Continue until you have all 13 stripes filled with hand prints. 4. Have the children dip their fingertips in paint and make the “stars” in the blue square. Have children make our country’s very first flag in the same manner and discuss why it looks different from the flag we have today. Have the kids make small U.S. flags and place them in red, white, and blue sand pails with sand filler at the bottom. Turn this decoration into a game. 1. Divide the kids into two teams and have them run, grab a flag, and quickly walk back to the team line. 2. The next person must do the same. The team with all of the flags in hand the quickest wins! 3. Be sure to have the kids take the flags home! 2. Divide the kids into two teams, and provide each with a spoon and eggs. 3. The kids balance a colored egg on their spoon and walk quickly from one end of the game area to the other and return. 4. If the egg drops, the team member must begin again. 5. The first team with all members completing the relay race wins! Two sets of clothing consisting of: Uncle Sam’s hat, a white beard, a blue jacket or shirt, red clip-on bow tie, and a bell. 1. Separate players into two equal lines spaced approximately 6 feet apart. 2. Place a set of clothing at the beginning of each line; then place a bell approximately 15 feet in front of each line. 3. On ‘go’, the first player in line dresses up in the clothing; then MARCHES to the bell. 4. When they reach the bell, they pick it up with their left hand, turn and face their teammates and then ring the bell. 5. They replace the bell and MARCH back to the front of their line–remove the clothing–and go to the end of their line. 6. The next player repeats the process; repeat until the last player finishes. The first team to finish is the winner. ***Click for a great variety of RELAY RACES and picnic games …(Races, Relays, Balloon and Bean Bag Fun!) You may also like some PARACHUTE GAMES! FUN IDEA → If you’re having a party, as a warm-up game write down jokes on individual slips of paper. Half the kids/guests get the Question–and the other half get the Answer! Good fun with kids trying to find their Question and Answer match! This is a fun project but NOT a recipe for drinking! 1. Pour the milk into the baking pan. 2. Drop several different colors of food coloring all around the milk. 3. Add a “squirt” or two of the dishwashing liquid, and watch the colors burst and swirl. The dishwashing liquid separates the fat from the other liquids in the milk. If the fireworks slow down, just add another squirt of dishwashing liquid. These flowers look great for any red-white & blue theme!. 1. Pour water into a glass of water. Add 7 to 8 drops of red food coloring to the glass. 2. Pour water into another glass and add 7 to 8 drops of blue food coloring to the glass. 3. Cut the stem of a white carnation lengthwise. This will make the carnation stem into two thin stems. 4. Set the two glasses of colored water together. Put half of the stem of the carnation into the red water and the other half into the blue water. 5. Let the carnation sit for a few hours. The carnation will begin to change gradually into red and blue. 6. Take the flower out of the mixture in just a few hours before the colors can change the white carnation entirely. You want it so that some of the white is still on the carnation. 7. Wrap the stems together with green thread and place the carnation into a clear vase of water. Make several flowers and show off your beautiful red, white and blue flowers in a vase. Kids will enjoy making these using white flowers such as daisies, mums and carnations. 1. Pour water into a canning jar with several drops of red or blue food coloring. 2. Place the flowers into the jar over night. Don’t forget to set some of the white flowers aside to add to the bouquet. 3. In the morning, place all of the flowers into a fresh vase of water and tie red, white and blue ribbon around the top of the jar. (Do this outside) This is a reaction between Mentos candy and cola. The experiment involves dropping several Mentos candies (usually 5–8) into a bottle of diet cola resulting in an eruption occurring because of rapidly expanding carbon dioxide bubbles on the surface of the Mentos. I tried this experiment with three of my grandsons (Ages 6, 8,11-see photo) They all loved it! We quickly put five mentos into the Coke. The reaction starts immediately-so be quick! ….is a model rocket fashioned from a 35mm film canister and propelled by the generation of gas from an effervescent liquid. It is often used in science classes to demonstrate principles of chemistry and physics to students. 3. The canister may be elaborated with paper fins to resemble more closely a real rocket. Lessons based around the Alka-Seltzer rocket can focus on a number of principles. For example, the students are sometimes asked to experiment with the amounts of water and Alka-Seltzer to find the combination which propels the rocket the greatest distance. Have a child’s wagon you’re not using? Plan ahead for your ‘Patriotic celebration’ and fill that wagon with red, white, and blue flowers. Include a sweet alyssum border, geraniums, lobelia, cosmos, begonias, and impatiens. For the finishing touch, add American flags to the mix. Our flag has 50 stars, in the U.S.A.
1. Using crepe paper and streamers, have the kids DECORATE THEIR BIKES, scooters, wagons, and younger children’s strollers. You can also attach playing cards to the frame so they hit the spokes & sound like a wheel of fortune. 2. Make musical instruments from ‘Recycled materials’. See gads of instrument ideas on KidActivities. 3. You could also take shoe boxes and have the children make “themed’ floats from them! These could be carried in the parade. 4. Encourage all to wear red, white and blue clothing! You now have all the makings for a great parade!!! Plan your parade route and then hand out fliers to alert your potential audience of the event— which would be your neighborhood and parents. Invite all to watch! You can parade around the school or center block, track or playground. Ride the decorated vehicles, wave banners and march, play the pre-made (and practiced on) instruments, sing, and have a great time!!! Consider having an ICE-CREAM SOCIAL! You can also give out awards …such as the Best Red, White and Blue Bicycle; Most Original Bicycle; Most Creatively Decorated Bicycle; Most Appealing to Spectators, Smallest, Most Covered, Most Unique, etc. You can also have a “SLOWEST BICYCLE RACE” with decorated bikes… See the Mixing Math and Fun Category (near the bottom of the category page.) Add this to ideas for a ‘Red, White & Blue’ program parade around the neighborhood!!! We did one with our families last year and it was great fun!!! We’re in a quiet neighborhood—advertised for two weeks before—and had all the neighborhood out to watch us!Cassie/Mi. Families carrying homemade banners pinned across a broomstick. Pets with red, white and blue ribbons in their leashes or collars. A parent and kid kazoo band. In-line skaters wearing red, white and blue T-shirts and helmets, of course. Bigger kids dribbling red, white and blue basketballs or soccer balls. A teenage DJ carrying a boom box playing patriotic songs. Bikes, strollers, wagons and wheelchairs sporting streamers and balloons. A minuteman marching band featuring kids playing oatmeal-container drums and paper-towel-roll fifes. Band students can chime in with their trumpets and clarinets, and even moms and dads can dust off their old instruments and join the fun. A clown (a parent dressed in costume) tossing penny candy to the crowd. Use tape, streamers, flags and balloons to transform a fleet of wagons into patriotic parade floats. 46) CAN YOU NAME THE ORIGINAL 13 COLONIES? 47) DOES ANYONE KNOW WHO DESIGNED THE FIRST U.S. FLAG? Betsy Ross –but the answer (according to the experts at the ‘Betsy Ross house’) is that it was possibly designed by Francis Hopkinson, a New Jersey delegate to the Continental Congress and a signer of the Declaration of Independence. You may also be interested in the ‘Cherry Theme’…lots of good ideas that would work with some Red-White-and Blue’ Summer Time Fun! HAPPY RED. WHITE AND BLUE DAY! Have some ‘Patriotic fun’ with your fruit! Pull out the star-shaped cookie cutters and serve the shapes mixed in a fruit bowl…on a platter…or on long tooth picks or skewers! Select some large, firm strawberries. Wash and pat dry. Dip one side of each strawberry in either melted semi-sweet dipping chocolate or vanilla-flavored almond bark. (If using melted chocolate chips, add 1 teaspoon of shortening to thin.) Immediately roll coated side of the strawberry in chopped nuts, coconut, or red, white, and blue candy sprinkles. Place on wax paper until chocolate is set. Eat as a snack or place on the top of ice cream, cakes, etc. Melt the white chocolate morsels according to the package directions. While chocolate is hot, dip the pretzel rods halfway into the melted chocolate. Sprinkle the star decorations or the red, white and/or blue sprinkles onto the chocolate on each pretzel rod before the chocolate cools. Place coated pretzel rod on waxed paper or in a cup (decorated side up) to dry and cool. Prepare the veggies and place around a plate. Pour about 1/2 cup ranch dressing into a dish and combine with about 10 drops of blue food coloring – mix well. Chill and serve! Prepare the veggies and place around a plate alternating colors. Pour about 1/2 cup ranch dressing into a dish and combine with about 10 drops of blue food coloring – mix well. Chill and serve! 1. Combine strawberries and glaze in a small bowl. 2. Slice Twinkies in half lengthwise, and place in a single layer over the bottom of a 9 x 13 inch dish. 3. In a mixing bowl, beat cream cheese and condensed milk until smooth. Fold in whipped topping, and spread mixture over Twinkies. Spoon berries over cream cheese mixture. Sprinkle blueberries in with strawberries…Cover and chill 30 minutes or more. Refrigerate leftovers. Note: People that have made this suggest making it in a trifle bowl or double decker the Twinkies. They have said that ‘8 Twinkies’ is not enough—12 to 20 Twinkies (depending on container) would be better—and that the cream topping would NOT have to change in proportion. All really liked it! Take a store bought pound cake (such as Sara Lee) and slice it long wise into three slabs. Cover the first slab with sliced strawberries (drain first). Add the second slab and cover with blueberries (drained). Top with the remaining slab and frost with either cream cheese frosting or whipped topping. If using cream cheese frosting, refrigerate. If using whipped topping, freeze. Serve immediately (allow the frozen version to thaw). Allow vanilla ice cream to thaw somewhat— remove ice-cream from the carton and mix in fresh strawberries and blueberries. 1. Prepare cake according to package directions and bake in a 9×13 inch pan. Cool completely. 2. Frost cake with whipped topping. Place blueberries in a square in the corner, and arrange sliced strawberries as stripes to make an American flag. Chill until serving. Prepare black cherry flavored gelatin using 2 cups of boiling water and 1 cup of cold. Add blueberry pie filling and stir until filling is mixed in thoroughly. Pour into the baking dish and place in the refrigerator. Allow to chill until firm. Prepare lemon flavored gelatin using 1 cup of boiling water. Beat cream cheese slightly and then add the lemon gelatin mixture. Beat gelatin and cream cheese until smooth. Set aside and allow to cool to room temperature. Once the cream cheese mixture has cooled, fold in the whipped topping until mixed thoroughly. Pour this mixture over the firmly set bottom layer. Return to the refrigerator. Prepare the strawberry flavored gelatin using 2 cups of boiling water and 1 cup of cold. Add the frozen strawberries and stir to mix thoroughly. Cool this mixture until room temperature and then pour over the middle cream cheese layer. The cream cheese layer should have been chilled long enough to become firm. ……..Select 12 good quality strawberries and slice each strawberry in half. The green leaves can be kept on the berry or removed, if desired. ……..Use a melon ball scoop to remove the center of each half slice of the strawberry and fill each scooped half slice of strawberry with approximately 1 teaspoon of yogurt, or any white filling desired, such as a fruit dip, custard, pudding, or whipped topping. Top the yogurt with a blueberry and serve, or chill to be served when ready. Lightly grease a 13×9-inch baking pan. Pour in the cherry pie filling. Top with the blueberries. Sprinkle the dry cake mix over the fruit, then drizzle the melted margarine over the top. Finish with the nuts. Bake at 325 degrees F for 45 minutes-or until done. Make red, white and blue fruit skewers or arrange a fruit tray. Serve with white dip-or add food coloring to dip. Snack on red, white, and blue potato chips and tortilla chips. Serve them with sour cream and salsa. Cut red and white cheeses into chunks. Place toothpicks into cheese chunks for easy serving. Make skewers of red meats, such as pepperoni and sausage, with white cheeses. Arrange white crackers on a tray. Add red or blue food coloring to sour cream or other dips. Make red and blue ice cubes by adding food coloring to ice cube trays. Drop blueberries, cranberries or rasberries into ice-cube trays of plain water. Serve “red pop”, red punch, smoothies or red and blue Kool-Aid. For adults-serve red and white wines. Bake a batch of white sugar cookies…Frost and decorate with patriotic frosting and red, white, and blue toppings. Sprinkle red, white, and blue sugar on top just prior to baking. Divide cookie dough into three parts. Add red food coloring to one, blue food coloring to another, and leave the third part white. Top a cupcakes, white cake or ice cream cake with strawberries and blueberries…also see above ‘Flag Cake’. Make red, white, and blue Jell-O Jigglers. Use star-shaped cookie cutters to cut them out. Make single-colored batches of Jell-O using blue raspberry, cherry, strawberry, strawberry banana, strawberry kiwi, etc. Layer the colors by allowing the bottom layer to settle before adding another color. Cottage cheese, cream, cream cheese, milk, plain yogurt, vanilla yogurt, sour cream, vanilla ice cream, white cheese (swiss, mozzerella, etc.). FOOD FUN… RED, WHITE AND BLUE TASTE TEST! Put out all sorts of food and spices in a series of small dishes. Blindfold the kids (and maybe even adults) and have them guess what each food is. Ideas for tasting include salt, ketchup, blueberries, strawberries, mayonnaise, sponge cake, strawberry jam, pepper jack cheese, beets, tomatoes, bananas, cherries, etc. Smoothie Recipes are all from the Smoothies, Shakes, and Coolers Page. Visit it for general directions and many more ideas! Combine all ingredients in a blender and mix well. Makes 4 to 6 small servings. Combine all ingredients in blender; mix until smooth and frothy. Whirl all together in blender! In the container of an electric blender, combine blueberries, juice, yogurt and sugar. Blend until smooth, about 1 minute. Serve immediately in tall glasses. Combine the blueberries, frozen yogurt and milk in a blender or food processor. Blend until smooth, adding more milk if necessary. Serves 1. Combine ingredients in blender and blend until smooth. Pour into glasses and serve immediately with drinking straws. Place all ingredients into a blender in the order listed. Blend at a low setting for the first minute, then the high setting until smooth. This is cool and creamy, but light—with strawberries, coconut milk and a nice soda fizz. Combine all ingredients in blender and process until smooth. Pour into two tall glasses. …This one is sooo good and easy too! This is extremely easy to make…just chunk up a watermelon and put into a blender. After combining watermelon, add PRE-MADE lemonade ice-cubes and continue to whirl in the blender. This drink will not be ‘slushy’ but more of a smooth or watery drink. Add a few ice-cubes (made from water) to a glass and enjoy! The cooler is best if drank immediately– as it will separate as it sits… (The pictured drink was made using about 3 cups of watermelon and about 7 small lemonade ice-cubes. If too many frozen-lemonade cubes are used, they will overpower the drink. First, purchase or make your favorite lemonade. Add a variety of sliced fruit. After being refrigerated, the lemonade will pick up the color and taste of the added fruit.